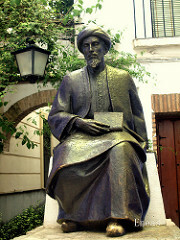 Maimonides, Moses ben Maimon, 1135-1204, born in Cordova, Spain, died in Cairo, Egypt. Being a Jew, he was force to flee from Spain with his family when the Muslim Almohades came to power in 1148 as they imposed conversion to Islam or death. After years of wandering in Spain, he and his family settled in Fez by 1160, the cultural center of Morocco. There, he was educated by Spanish-Moroccan physicians. In 1165, Judah ha-Kohen ibn Susan, Maimonides’ master, was put to death for not accepting the Islamic faith, the student fled to Israel, Alexandria and finally to Egypt. In Cairo, Maimonides eventually resumed medical studies begun in Fez and became a physician to al-Fadil, the vizier, who actually ruled the country after Saladin’s departure in 1174. By 1190, he was the sultan’s personal physician. Further, he had his own private practice. Maimonides wrote 10 books on medicine. The manuscript that most influenced the Hispano-Arab culinary world was El Tadbir al-Sihha (“Guide to Good Health”). This treatise on hygiene was written in 1198 for Afdal Nũr al-Dĩn Ali, Sultan of Egypt, who suffered from depression. Maimonides stressed the physic state of the patient in his daily environment including exercise, diet, cultural life and friends. Maimonides maintained that a happy person is a healthy person. Maimonides began the trend of using chicken soup as medicine. 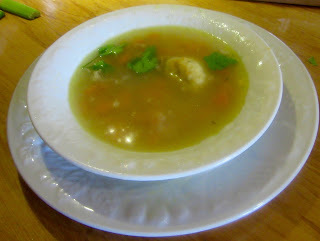 He recommended hens’ broth ad that made with other fowl to “neutralize the body constitution.” He thought boiled chicken soup helped to cure leprosy and asthma. He claimed that whole wheat bread was the most valuable bread for the quantity of protease contained in it. This is an essential fiber for intestinal peristalsis. Maimonides not only gives nutritious assets but provided the culinary procedure. He also provided an extensive list of herbal remedies. His nutritional remedies are still used today. As a pass time, Maimonides served the Jewish community as their leader. The Mishneh Torah, a systematic code on all Jewish law complied in 1180, was his major contribution to the Jewish culture. It is a guide for Jews on how to behave in all situations by reading it with the Torah. Further, he wrote the Guide to the Perplexed, a commentary on the entire Mishna. He has been acclaimed as “the only philosopher in the Middle Ages who symbolizes a confluence of four cultures: Greco-­Roman, Arab, Jewish, and Western.” His teachings were not exclusive of Jewish interests. The Guide consists of philosophical writings about theological issues in general and about God. Upon reading his works Muslims and Christians forget he was a Jew. Perhaps for this he has been acclaimed the “most influential Jewish thinker of the Middle Ages, and quite possibly of all time”. For the diet he recommended whole wheat bread and chicken broth. See maimón and Nueva-Clásica Cocina Andalusí. Add them to the water and simmer. Do not let the soup boil. Add the remaining ingredients and partially cover. Simmer for 2 ½ hours. Skim foam and scrum on top frequently. Remove chicken and carrots from the broth. Remove the bones from the chicken and return them to the broth. Simmer for 1 ½ hours. Chop the carrots and shred the chicken and set aside. Remove broth from heat. Remove the lit and let cool. Strain the soup through a sieve into a bowl. Squeeze the water out of the vegetables into the bowl. Add half the shredded chicken and carrots to the broth. Garnish with matzo balls and dill before serving. 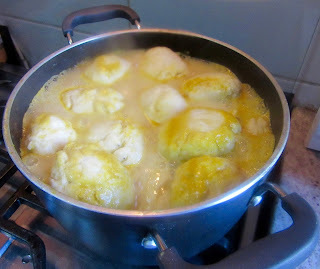 See blog titled maimón published January 29, 2016 for recipe.